Home / What to do with your Zombies and Ghost Servers? What to do with your Zombies and Ghost Servers? You know those servers that you have out in your data center, powered up but doing nothing, what do you do with them? While you can simply just let them continue running in your data center, they can actually be costing you more than you think. Consider that a typical five year old server, which may not be energy star compliant could consume 175 watts at idle. And if 10% of the servers in a 1000 server data center are ghost servers and electricity costs $0.15/kwh, we are talking about $23,000 of un-necessary expense. AND this is just for the server, never-mind the cooling expense. So what do you do? Do you take the risk and power them down, decommission them, and deal with potential screaming and risk of loss of operations later? Probably not. The first thing you might want to do is to create a plan of action. Identify which servers are actually idle or under-utilized, where they are physically located and their associated owners. Without a Data Center Infrastructure Management (DCIM) solution, this could require manual work. For example, lookup excel files that store the information on the old servers, go to the data center to audit and verify information/existence, deploy power monitoring or server workload tools to verify utilization rates, find owners, etc. If even available, the owner information is more than likely out of date. Rather than taking a drastic step and randomly just shutting them down, companies like Barclay's and Bloomberg have put into place strategic plan that has garnered company wide acceptance. The steps that have made them successful include: designing a workflow diagram agreed to by all stakeholders, automating the change management process including approvals, customizing the process where needed – including various notification processes and timelines, and continuing to manage and maintain. A complicated process? Not really, if you have DCIM. A DCIM system will provide you with substantial benefits in managing your decommission process. First, DCIM provides a real-time accurate inventory view of all the assets in your data center – owners, location, application information, and power utilization trends are all stored in a single, searchable database. And not only that, connections – power and data, are also part of the asset information allowing you to know what is connected to what and what might be impacted or what additional capacity you might free up if a server is decommissioned. Second, a DCIM with a change management component provides for automated workflows and approval processes. No longer will you need to wander around the data center looking for someone to approve the request. Work orders requesting decommissioning activities for all associated components and connections are issued. Completed items are automatically documented and freed up inventory becomes available for reassignment. Finally, how do you prove that this is really all worthwhile? DCIM software provides real time information at a click of a button to help capture the savings due to the resulting changes in power and environmental (think a/c) requirements. Additionally, a DCIM solution that helps aid in the decommission process can help you save in hardware maintenance, software maintenance, and data center space while improving the productivity of people planning and working in the data center. And don't forget the intangibles, using a DCIM in managing a data center can simplify processes while reducing your risk to accidently shutting down something that might seem dormant, yet might be critical to operations. 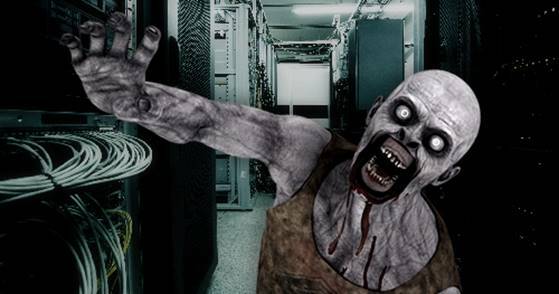 Be sure to invest in a DCIM and don't let the Zombie capture you.